Whether you are a movie maker, a film director, a stage manager, an editor, a musician or you just create short movies and run your vlog, you obviously need a professional approach in your area of activity. If this is not just your hobby, but it’s also your career plan, then it’s the very time to make your first steps into this huge world of movie directing, film reviewing and media expertise. The following WordPress themes will be appropriate for movie campaign and film marketing, movie promotion or film portals, online magazines and newspapers, movie schedules, online cinema tickets booking, movie review websites, and other related resources. Take your theme and launch your first website for film fans or just easily start your video blog. 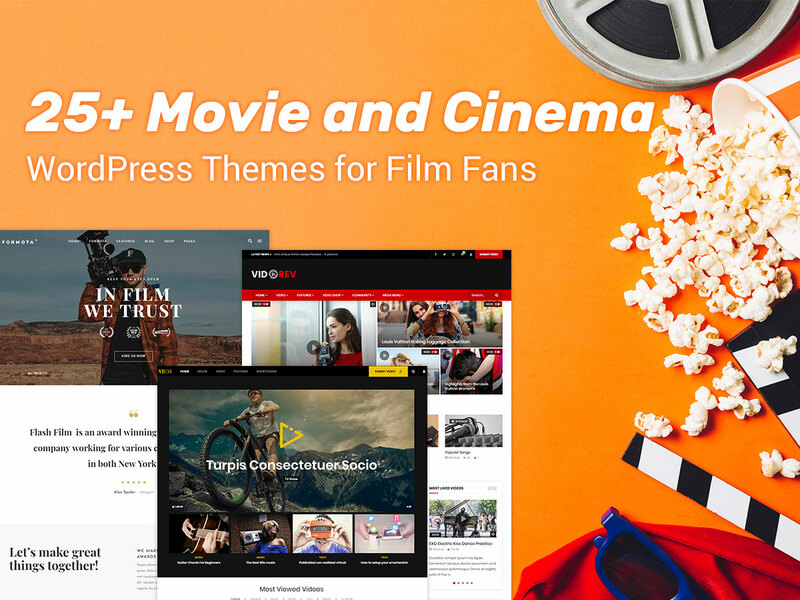 These themes include all necessary functionality to create comprehensive, multilingual, intuitive and attractive full-fledged movie related websites for film fans across the globe. You can also choose a good design to revamp your existing site and make it look as an up-to-date online project with really cutting-edge appearance. Spool is an awesome WordPress theme perfectly suitable for movie makers and film studios. It comes with 6 homepage layouts including the ones for film maker, interactive links, wedding films, drone shooting, movie studio and one screen ones. This template has a number of features and premium plugins included in the pack. It boasts the integration with WPBakery page builder, Contact Form 7, WooCommerce support, advanced side menu, grid photo gallery, unlimited custom portfolio pages, fullscreen blog layout, and many more advantages. This is one more movie studio and filmmaking WordPress theme suited for agencies, personalities and companies. If you are a film director, actor, or you run a movie studio, you can take this template for launching your online presence in a professional manner. Features of the theme suppose newsletter popup included, easy customization colors, WooCommerce support, boxed and wide layouts, more than 12 homepage templates, 6 blog styles, 6 header styles and 4 footer variants, Contact Form 7, modern design, Bootstrap 3 based options, smooth CSS3 animations, tones of awesome icons, etc. 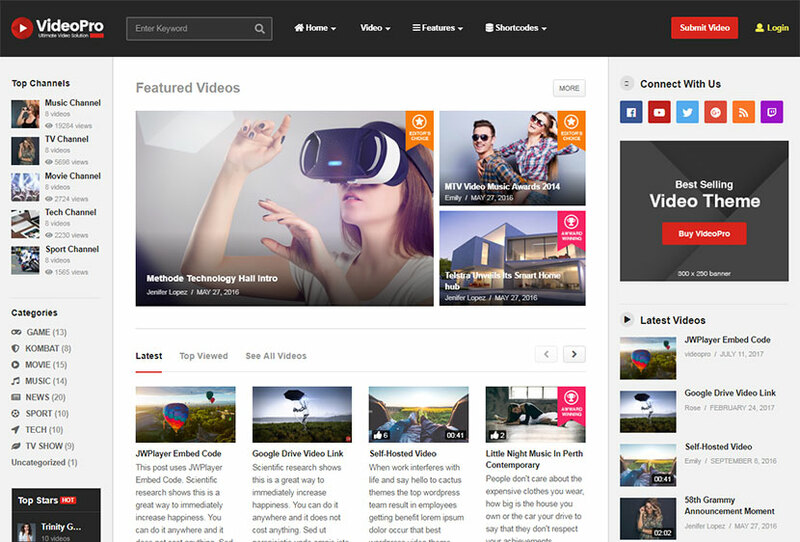 This is a video focused WordPress theme suited for vlogs and video sharing websites. It comes with 8 homepage templates with more ones coming soon. You will find homes for videos on cooking, travel, beauty, fullwidth and boxed styles, as well as other purposes and designs. The theme allows to play videos from your local drive, add video ads and popup ads, use the Envato’s Elite video player, take advantage of mega menu, unlimited color options, powerful theme options, embedding support including YouTube, Vimeo, self-hosted resources, child theme compatibility, translation ready support, community videos, and much more. One more WordPress template made for movie studios and film makers. It comes with 10+ homepage layouts for movie portfolio, film festival, director, and more. You’ll find the homepage styles like carousel, fullscreen slider, metro style, interactive design, etc. The template comes with easy-to-use powerful admin panel, a host of custom shortcodes, WP Bakery drag-and-drop page builder, various slide animation types, a number of shortcodes for video player, video button, section title, fullscreen sections, lightbox image gallery, and more shortcodes; 3 header types, 3 side area types, and more features. 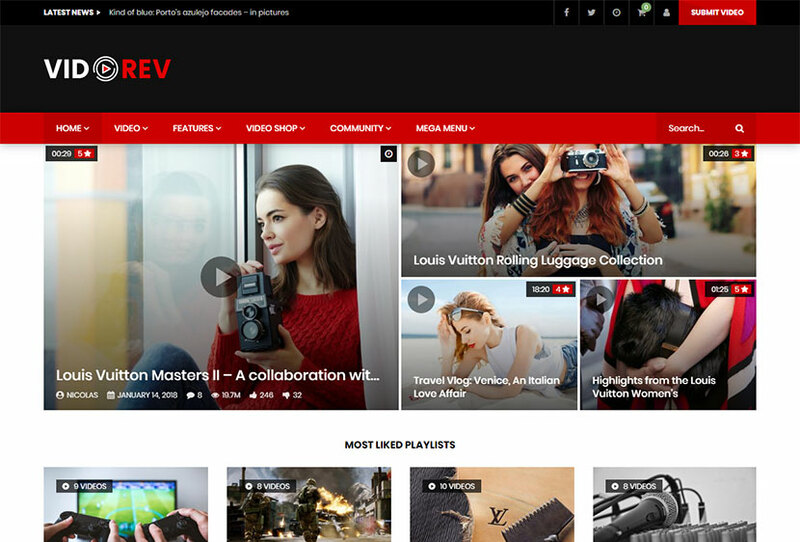 Vidorev is a video WordPress theme for a magazine, blog, news, movie website or a vlog. It comes with 7 homepage layouts including the ones for traveling, sport, blog, movie, technology, and much more. The theme supposes API functionality including Facebook embed video player, self-hosted video support, and more. Its features are such as WooCommerce video shop, user submit video, channel creation, beautiful video lightbox gallery, automatic fetching videos from different resources, pagination, unlimited overlap colors, and more. 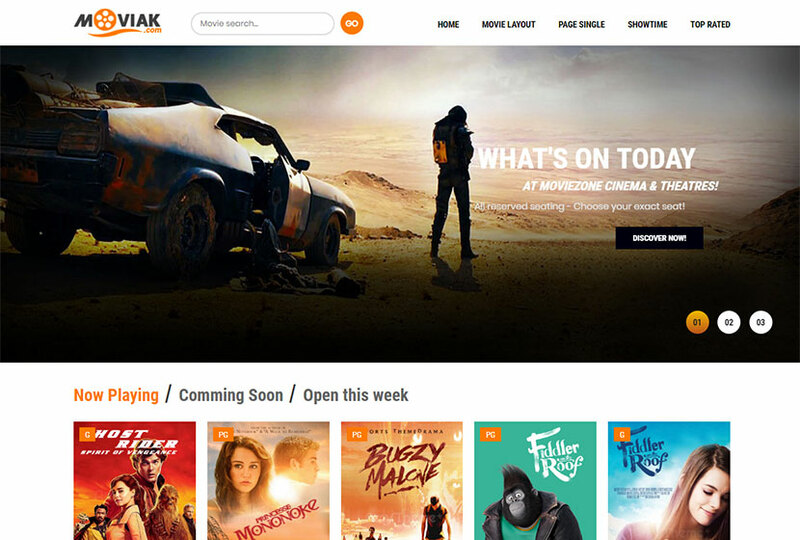 This is a movie and cinema WordPress theme which comes with 4 homepage layouts with different header styles and convenient search forms to look for movies and TV shows. It includes a multitude of awesome features helpful for building a full-fledged website. The theme comes integrated with WPBakery page builder, Revolution Slider, a number of theme options, unlimited colors, translation-ready support, Google fonts, full customization possibility, unlimited icons, IMDB compatibility, working contact form, movie custom post type, typography options, and much more. This is a director and video portfolio WordPress theme which will perfectly suit for actor’s portfolio, video or film director personal website, single movie promotional site, and more related purposes. The pre-made page layouts like biography, awards, filmographie, and other ones will come in handy when introducing your personality. The theme comes compatible with WPBakery drag-and-drop page builder, so you can easily build your website pages and content without any coding. As the template supports RTL, you can create a site using even Arabic language. Bootstrap 3 framework based option help to change the look and feel of your website. 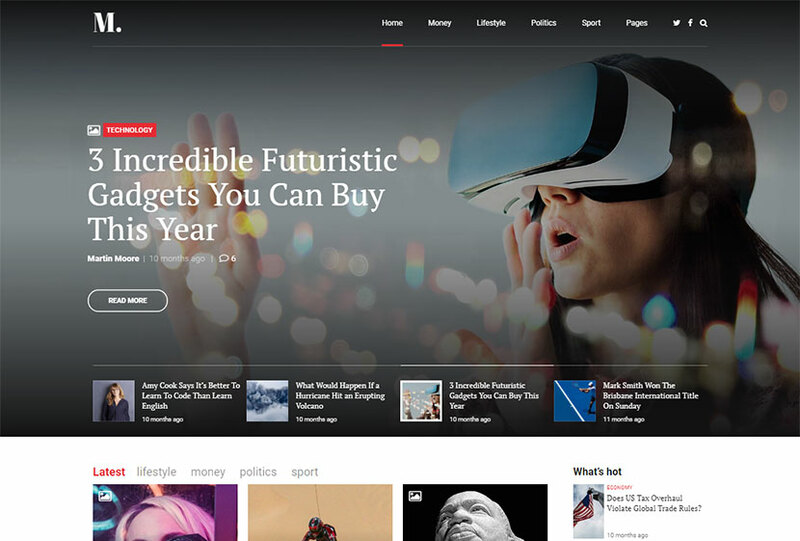 This is a flexible news and magazine WordPress theme which can be perfectly suitable for running a film news website, a movie focused magazine, or build some other related resources. It comes with 4 sets of demo pages to choose from and customize to your style. The template is designed to be fast and comes with multiple features like WPML and RTL support for building multilingual websites including Arabic one, custom headers and footers, typography and color options, accelerate mobile pages, a collection of shortcodes, WooCommerce compatibility, and many more features. 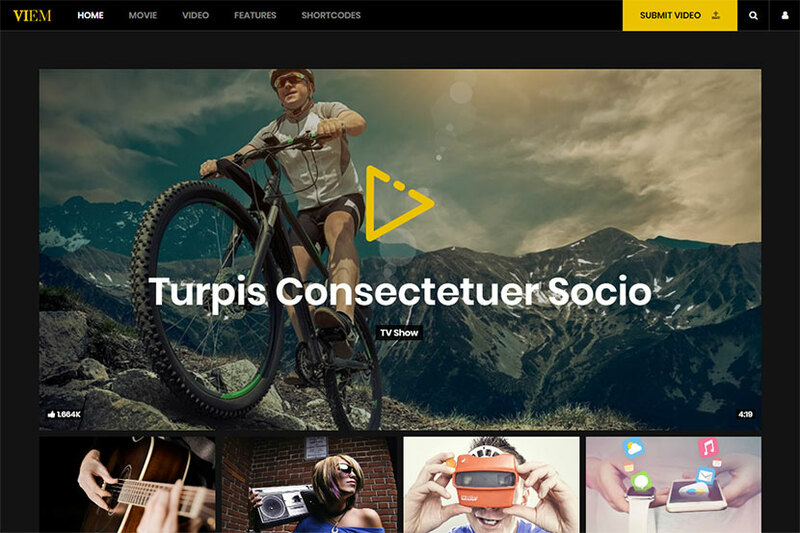 Superflick is a video oriented WordPress theme suitable for video artists, film makers, movie studios, vloggers, agencies, and more related creatives. It comes with 11 homepage layouts with different design styles to meet the most varied tastes. The theme’s features include intuitive admin interface, unlimited layout possibilities, WPBakery drag-and-drop page builder integration with additional custom elements, different portfolio layouts, Slider Revolution support, WooCommerce functionality, wishlist, ajax shopping cart, 8+ menu layouts, mega menu, 6 widget areas, and much more. 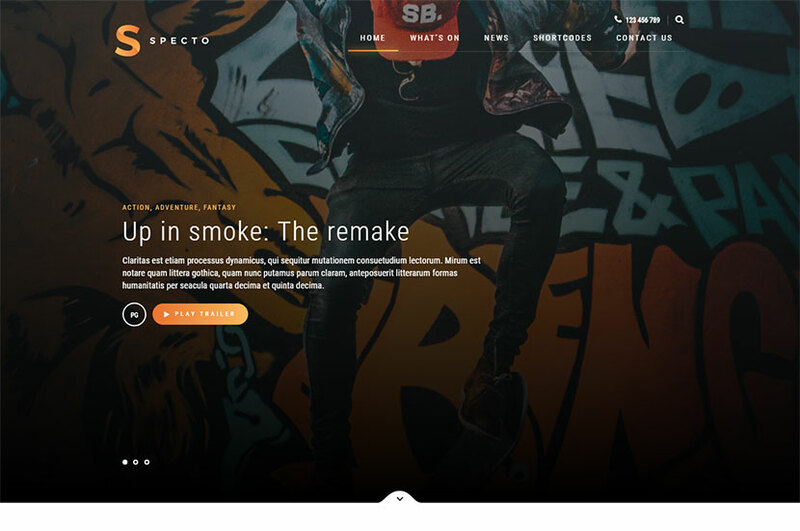 Specto is a cinema WordPress theme which can suit for promoting the playbill of upcoming movies shown in the movie theater in the next month. You can also use the theme to promote a single movie, create a showcase or a trailer site. 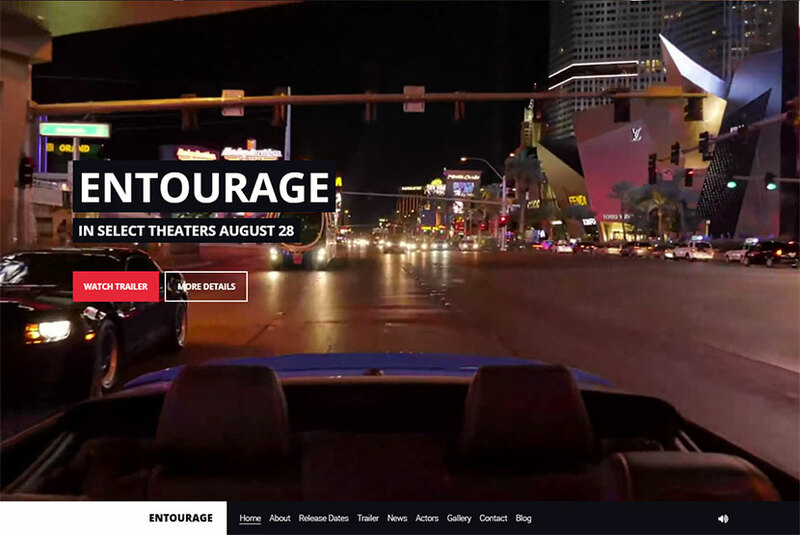 The template boasts modern design, the feature to automatically show next available movie to a user, visual page builder providing a possibility to create custom layouts, YouTube and Vimeo video modal, slick slider carousel, real time movie search, CSS3 animation effects, Bootstrap 3 grid, multiple reusable shortcodes, and more features. No matter you are a newbie or an experienced movie maker you surely require a personal website to introduce yourself to future devotees and you film fans. Perfect promotion is an integral part of any creativity, so if you make creative works they require to be promoted in a professional level. When it comes to movie directing, perfect marketing campaign is especially required. This WordPress theme is suitable for creating a vlog, a film production website, a promotional website, a film maker center, a film studio or a movie review website. The theme comes with clean, elegant and modern design, smart email system, Visual Composer page builder plugin and WPML support. Lots of features available for the theme allow to create a multilingual comprehensive website which is easy to edit at any time without any coding knowledge. Every movie director wants to be rewarded for their tough and ingenious work and may be even get Oscar for best directing. The first step is a great storyline, best actors, team and equipment. When the movie is ready, it should be perfectly presented and promoted. It’s of course necessary to create a stunning website to advertise your single movie premiere, upload its trailer and sell tickets. The following theme will come in handy. This is a fully responsive WordPress template designed for film promotion but also available for introducing projects, videos, events, photos, and more. The theme can be used for any promotional website you prefer. It is built on Visual Composer, and it is easy to edit by dragging and dropping content elements. 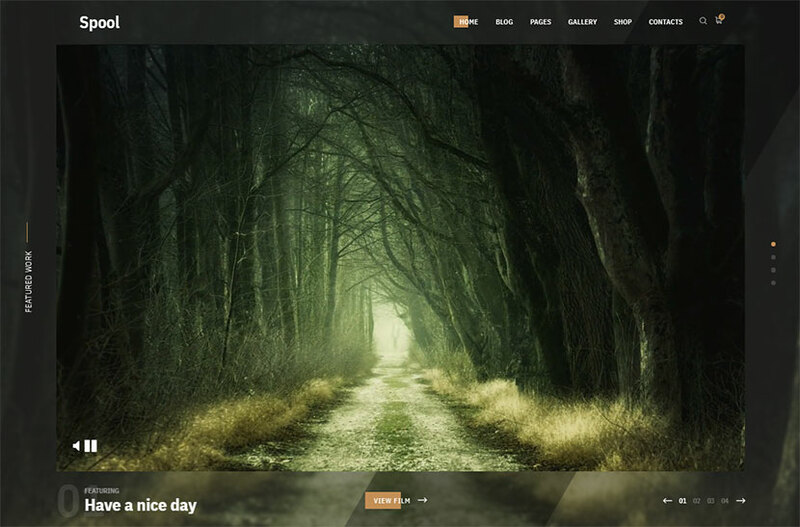 The theme includes four homepage layouts in video, image, slider and countdown styles. Unlimited colors, shortcode generator, powerful theme options, and many more features are available. A film directing is of course a creation and it’s impossible to create anything really ingenious and popular without any talent and creativity. If this talent is complemented by professional education and amazing film marketing campaign, the success is guaranteed. If you are a future film maker and you’ve got an idea concerning your future movies, create your website and look for a sponsor for your ideas, some fellow stage managers or film directors, and other people interested in your project. 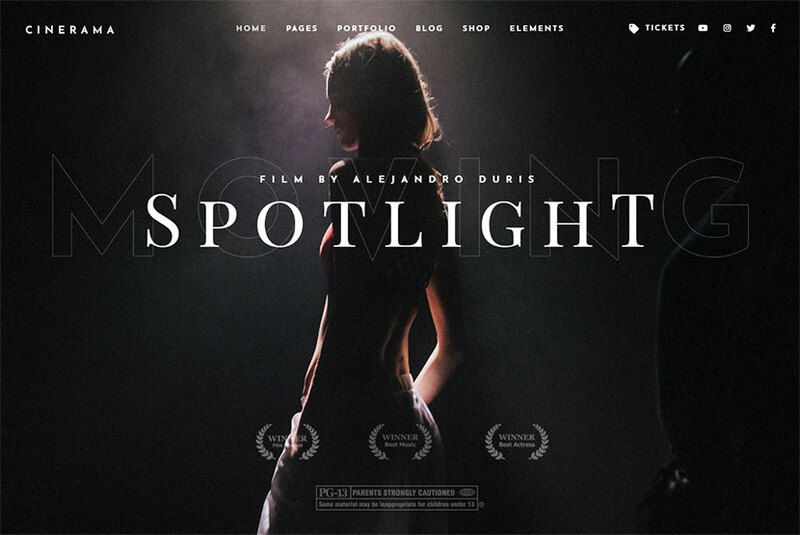 This is a full-featured film production WordPress theme suitable for creative agencies, corporations, teams, personal use, film studios, film production vlog websites, and more related resources. The theme comes with beautifully designed homepages, responsive layout, elegant and modern design and a lot of features. 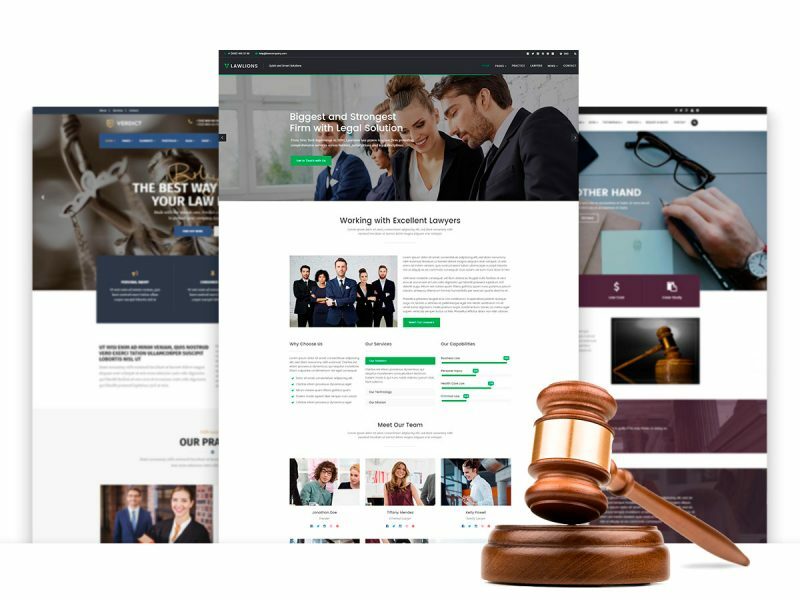 It includes Visual Composer page builder and Revolution Slider premium plugins, 5+ homepage styles, 2+ header styles, 4+ news archive styles, 2+ gallery styles, 2+ team page styles, and much more. Any video based website is mostly popular in the community of young people who like to find out more exciting facts from various areas of life, creation, rest, travel, business, and more. Video portals and video hosting websites capture their own niche of recognition and carry a good amount of visitors every single day. Create your own video based website and make sure this is a great chance to create your own community of fiends by interests and even earn some revenue. This WP template is a perfect solution for creating a video website either for games, movies, news, entertainment, science, and other fields. The theme allows visitors submit posts, it supports various networks and allows to use direct links from Youtube, Dailymotion, Vimeo, and more. The theme allows to build a movie database with multi-episode series, create a video playlist, setup video channels, catch the future of live videos, and much more. Someone’s passion is music, and others prefer movies for their leisure and free time when they are having rest. No matter you learn, you work, you want to get inspiration or you just need to relax and watch interesting and cheerful film without any complicated storyline, you are sure to look for “novelties” on movie and music portals. This means you are likely to read reviews to find out what people think of every creative piece released by producers. This WP theme is a great choice for a wide variety of entertainment websites and they include movie and cinema campaign websites, movie studios, musicians, video publishing, video library and magazines, music albums, and other related websites. 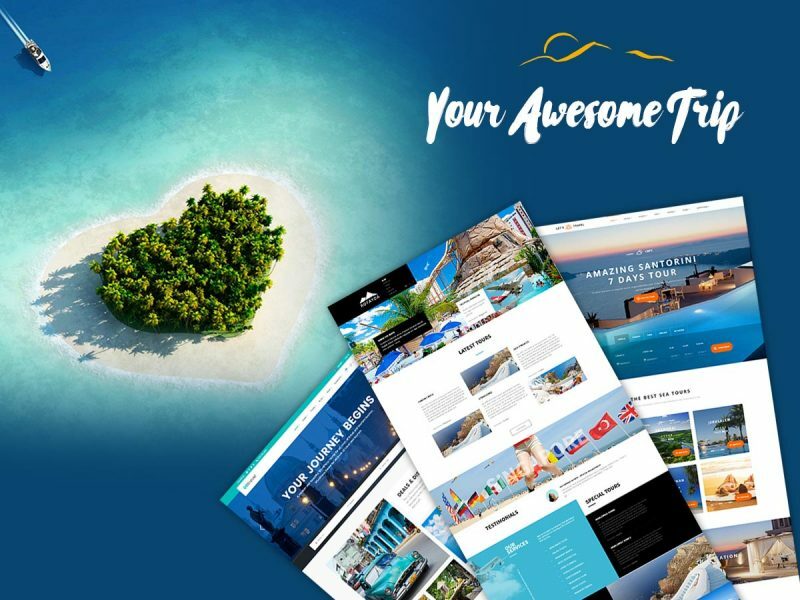 The theme comes with pixel perfect design and fully responsive layout, powerful theme options, 10+ header styles, 3 members page styles, amazing gallery variation, parallax video and image as well as many more useful features. There are different movie fans that appreciate only high quality movies in HD format or only go to the cinema. They never watch movies online on the screens of their laptops ‘cause the quality matter for them the most. However, other fans don’t care of a quality and prefer just a perfect storyline instead. No matter what type of a devotee you are, you obviously watch trailers to find out if you want to see this particular movie. 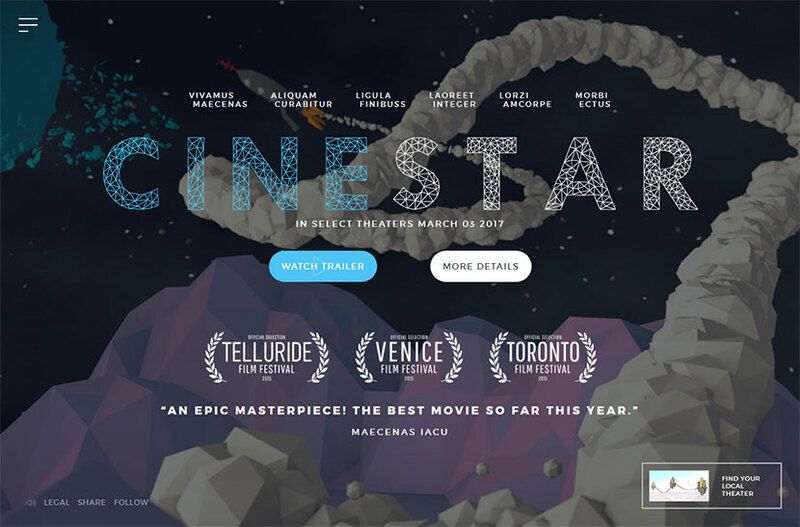 This theme is a great variant either if you want to create a promotional website for a single movie premiere, you want to upload trailers and movie reviews or you want to share movie schedules and let your visitors book cinema tickets online. The theme comes integrated with Visual Composer page builder plugin, it has a responsive layout, powerful theme options, one page and multipage versions, online booking functionality, and more features. It’s always great when a movie premiere or an upcoming full-length movie has its own official website. It’s good for a film marketing campaign and it’s great for film fans and haters that want to leave their comments and reviews after the film is released. You can upload a trailer before the film premiere and then upload a full version in HD or other formats. It’s up to you how to edit your website and what content you’d like to upload next. Vysual is an award-winning WordPress theme specifically made for movie campaigns and single film official websites. Of course you can customize it to create a film studio website, it’s always up to you. The theme utilizes built-in features of WordPress, making it really easy to use and setup. It is of course completely responsive, retina ready and mobile-friendly one. It supports both self hosted mp4 video and Youtube, Vimeo as well as other video hosting websites. The theme is translation ready, comes with video and slideshow backgrounds, and includes much more important features. A regular movie buff would say they can’t spend a day without allowing some time for watching a movie. It’s impossible for such people to spend a day without diving deep into fantastic stories of abstract people’s life, fantasies, destinies and storylines. Film fans often like to read film reviews to select the best ones to watch and discuss with friends, and this is a really great hobby. This WordPress theme is a perfect design variant for movie websites like portals, review sites or film services. You can use it to create a website with a movie list and their descriptions to help film fans find what they like the most and then share their opinions in the comments. This theme allows to import film data from IMDb and TMDb, it comes with great showtime features, and allows to create movie schedules in different local or globally known cinemas. Every grand movie premiere requires proper marketing and professional approach in creating its presentation. If the movie is properly presented and advertised, it is sure to cause interest of target audience, they are sure to buy tickets to be the first to watch it and a budget of a stage manager is going to be “redeemed”. Cool introduction is always a half of overall success. This WP theme is intended for creating the very website you require for you movie advertising aim. It includes both dark and light skin versions and includes a progress bar counting days, hours and seconds before the film premiere. The theme is made to focus the attention of a visitor to the details of a product. Beautiful scroll effects, Revolution Slider, unlimited colors and customization options provide you with freedom on control over your website and its content. If you dream to become a famous movie director, of course you should start from a professional education and practice. If you want to practice more and become a famous stage manager, launch your website and shoot your small custom-built movies. You can start your own movie company and then develop it to transform into a huge movie studio known across the globe. Start from small steps and think big! The following theme is here to help. This is a modern entertainment category WordPress theme which perfectly suits for film, tv, movies company and agency websites. The theme comes with 6 homepage layouts, WPBakery drag-and-drop page builder included, sticky header, blogging in styles, unlimited theme options, WPML and qTranslate multilingual support, child theme included, unlimited skins, Slider Revolution integrated, as well as many more awesome features. A movie of every genre requires its specific unique type of presentation. A horror movie trailer should include some scary and complicated intriguing moments; a comedy trailer should be cheerful and include some unexpected moments, and so on. Depending on a target audience, you adapt your movie and make it interesting right for them. You just highlight problems and tasks of a current time and a definite social group, and this is a professional approach. This theme is a great variant to present any movie of a space, civil war, history, nature, wildlife, and animation genres. The theme is built on Visual Composer and it is equipped with drag-and-drop interface allowing to properly edit its structure. Unlimited colors, Redux framework with its options, standard blog pages, shortcode generator, Revolution slider, and many more features come with the theme. If you are a movie fan, take your time to create a popular and globally recognized movie review website. It’s a great chance to do what you like and earn money with the things you are able to do at your best. Share your expertise and unveil your opinions, create your movie descriptions and encourage visitors leave their comments on every new movie you upload. You can also run you blog about most popular movies of your current time. Moview is a great WP theme for any kind of movie review or promotional film websites. You can use it to create a film database with reviews section, new and recent movies in theatres, DVD and Blue-ray releases, film classics, and more. Your website can be a place where everyone goes to discover new movies, video games, television shows and music albums. All features available for this theme give you a green light for creating such type of website with simplicity. Do you like to simplify your life? And what would you say of an ability to book cinema tickets for the best movie premiers right on the film’s official website? Of course it’s always good to be in time to purchase the tickets and be the first to see the very long-expected movie. If you’re about to build your website and you are a real movie fan, think about creating your own film portal and sell tickets online. It’s easier than you’ve probably considered. Omb is a great theme to realize all of your plans and dreams concerning website building. It integrates an online booking system for theatres and cinemas, so your visitors will be able to book tickets in real time and without efforts. 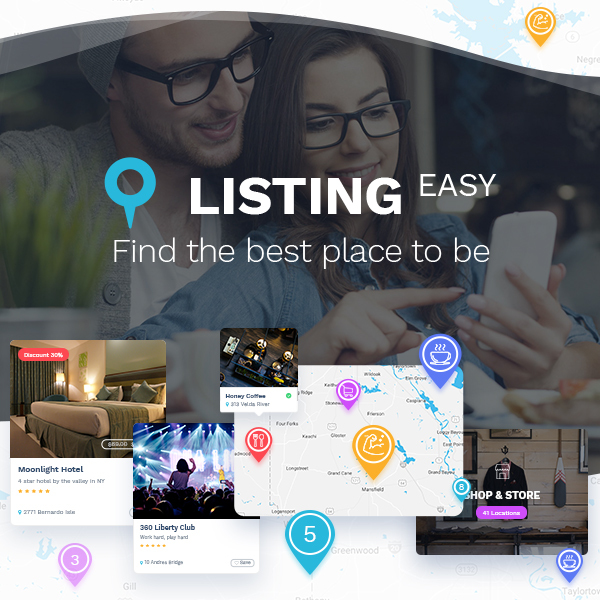 You also receive such unique page layouts as trailers, best offers, movies list, booking page, cinema / theatre page, coffee & bar menu page, and much more features. Are you a creative and you make movies or cartoons? Create your own movie studio website and start getting orders from clients that want you to make and direct a film for themselves, their friends or family. This will be a splendid headstart for your future movie director career and you recognition. Gather your own community of movie lovers and become a famous globally known film director to start receiving you awards. The Producer is a perfect theme for fulfilling your most sacred dreams and aims. 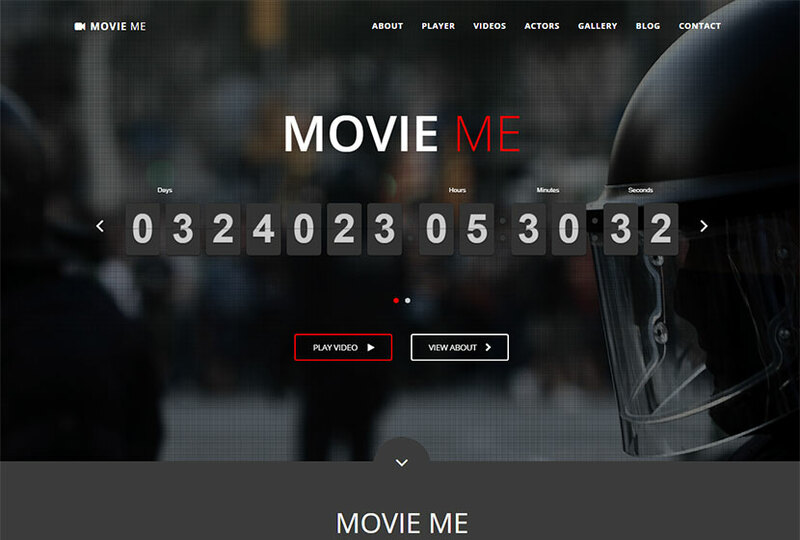 It is a film-focused WordPress theme designed for showcasing videos no matter what they are. The visual features of the theme include a unique panel effect together with a traditional credit roll effect when scrolling, and they look really special. Of course the theme comes with pre-configured page templates and lots of additional customization features. We’ve told a lot about a film campaign and its importance for promoting a movie no matter what it is. It’s always great when a single film official website with its trailers, testimonials, galleries and reviews, also has a well-made professional design with intuitive navigation, smooth scrolling, visible and clear menus, and pleasant look. The following theme is a top-notch solution including all of the enumerated features and advantages. This is an awesome WordPress theme that comes with dark, modern and professional interface and suits for movie and TV show websites. It has 6 homepage layouts – 3 for a movie site and 3 for TV show one. The theme also boasts mobile optimized design, 3 header layouts and a sticky header option, blogging in style, multi-language support, child theme included, unlimited skins, fontawesome icons, and more features. An integrated WPBakery drag-and-drop page builder makes the theme easy to manage and customize. Try it out! If you attend any online portals you are sure to know they are very popular among modern web users. Music, news of celebrities, movies and TV shows – all of that is interesting for people who look for an exciting leisure full of emotions. If you are also about to create a popular website and win recognition in your community, it’s time to create a news website, a movie portal, a music download website or a fashion blog. The following WordPress theme will come in handy for this. 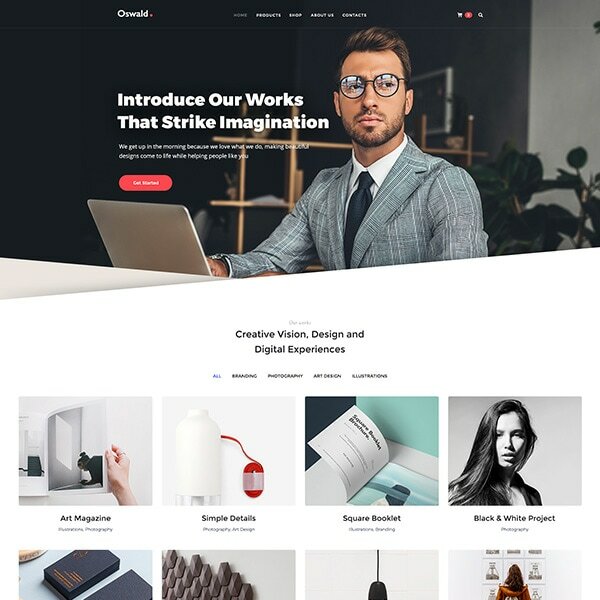 This is a powerful multipurpose template available for creating a website for almost any currently demanded subject including fitness, fashion, movie, music, travel, newspaper, and much more. The theme is based on a usable framework and allows to create a wide range of websites of a magazine type. The theme comes with live customizable options, custom brand color, grid, masonry and carousel layout variations, page and post advanced meta options, and much more features. If you’ve got any suggestions as for the further collections you’d like to see on our website, please drop a line in the comments. Thanks.